Explore our interactive map to follow in the scientists' footsteps and view video journals and site notes documenting the team's experiences during their expedition. You can take a look at—and listen to—the amazing birds found at each of the three study sites and learn more fun facts about each species' habits and habitats! 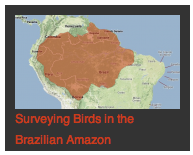 During the Amazonian bird survey, Dr. Jason Weckstein filmed a series of videos documenting daily life during the expedition and the amazing species the team captured in mist nets at their three study sites along Brazil’s Rio Japurá and its tributaries. You can view these videos individually below, or you can also explore our Amazonian Birds Expedition Portfolio on Vimeo. For more videos from Expeditions at The Field Museum, be sure to check out our YouTube Channel.